Do you know how much electricity you consume? Did you ever consider your electricity consumption pattern? If you answered ‘no’ to either or both of these questions, it may be time to start thinking. Amid rising living costs and increasing green efforts, the latest topic dominating kopitiams around Singapore is OEM. Not to be mistaken with the commonly known ‘original equipment manufacturer’, OEM here refers to the Open Electricity Market – a change in the electricity market that will allow households in Singapore to choose their electricity retailer. As of 1 April 2018, the Energy Market Authority (EMA) commenced the soft launch of OEM in Jurong, giving residents whose postal codes start with 60, 61, 62, 63 or 64 the choice of buying electricity from any authorised retailer with a price plan that best meets their needs. The rest of Singapore will be able to choose their retailer once the OEM is fully launched in the second half of this year. If you are one of the lucky residents in Jurong, you should read on to find out more! Is your house empty during the day when you are at work and you only get home at night to use the television and air-conditioner? This means that your energy consumption is higher in the night time. Wouldn’t it be awesome if there’s an electricity plan that has a lower tariff just because you consume electricity in off-peak hours? Actually, there is! 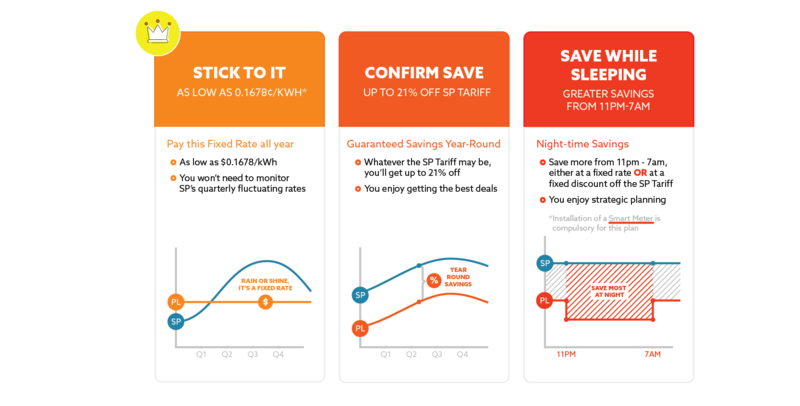 PacificLight’s Save While Sleeping plan is suitable for consumers with larger electricity consumption at night, as it offers greater savings from 11pm to 7am either at a fixed rate or at a fixed discount off the SP Tariff. Identifying your electricity consumption patterns and finding a suitable retailer with a price plan that complements your needs means that you can enjoy greater flexibility and savings! With a competitive market, retailers are going all out to impress potential customers like you with sweet deals, and this is especially so for Jurong residents partaking in the pilot OEM launch. For example, customers making the switch from SP Group can enjoy attractive promotions such as free 12-month Etiqa home insurance when you sign up a 24-month PacificLight home electricity plan. In addition to savings on your electricity bill, you can get extensive coverage for your home contents and renovations, 24-hour emergency home assistance, and family accident protection of up to S$50,000. Play a part in saving the Earth! With green electricity gaining traction with consumers, you can play a part in saving Earth’s limited resources. Simply use less electricity during peak consumption hours. Not only will you be able to save money, you will also be helping to conserve energy and preserve natural resources. For your information, EMA has progressively opened up the retail electricity market to competition for the benefit of business consumers since 2001. Allowing consumers the choice to choose enables competitive pricing, enhanced service standards and innovative offers from retailers. OEM will soon be extended to all households and businesses in Singapore in the second half of 2018. You should definitely choose an electricity retailer that provides the right price plan based on your consumption and lifestyle needs, guarantees a hassle-free switch from SP Group, and lowers your monthly bills. Most importantly, be sure to review the contractual terms, the price plan details in the fact sheets, payment terms, renewal clauses, and contract termination. PacificLight Energy is an electricity power generator and licensed retailer committed to helping customers manage their energy needs simply and effectively. The company offers 4 types of home electricity price plans: Stick To It, Confirm Save, Save While Sleeping ($), and Save While Sleeping (%). With Stick To It, consumer can rest easy knowing that the monthly electricity rate remains the same throughout the entire contract period, and consumer no longer need to monitor SP’s quarterly fluctuating rates! PacificLight can sweeten the deal with a discount off the regulated SP Tariff. With Confirm Save, consumer can enjoy a fixed discount up to 21%* off the regulated SP Tariff, which guarantees savings all year! Save While Sleeping is for consumers with large electricity consumption at night, such as those who go to work during the day and only get home at night, or those who can’t sleep without air-con at night, as it offers greater savings from 11pm to 7 am, either at a fixed rate or at a fixed discount off the SP Tariff. This is a way for the smart consumer to enjoy greater savings! PacificLight offers an additional 5% prompt payment discount when customers pay their monthly bill promptly and in full, and an additional S$1 off each month’s bill when you opt for e-billing! With the collaboration between PacificLight Energy and Etiqa Insurance, we hope to protect your home with positive energy. 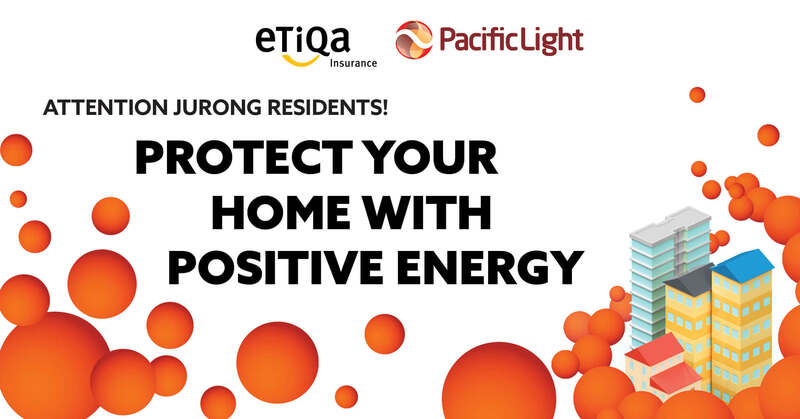 From 28 April 2018, Jurong residents can sign up for a 24-month PacificLight home electricity plan and receive a complimentary 12-month Etiqa home insurance, with the promo code PLEETIQA. Limited to the first 1,000 applicants. Sign up now and be lit up with this great deal at https://pacificlight.com.sg/promotions/pleetiqa or call PacificLight customer service hotline at +65 6266 1188.